We’re thrilled to welcome filmmaker Madeleine Hunt Ehrlich as one of our newest grantees! Madeleine is a filmmaker and a born and raised New Yorker whose work explores themes of physicality and female subjectivity. Her work has been featured in Essence Magazine, Art Forum, Studio Museum’s Studio Magazine, ARC Magazine, BOMBLOG, and Guernica Magazine, Small Axe journal among others. She is the recipient of a 2015 TFI ESPN Future Filmmaker Award and a 2014 Princess Grace Award. Her work has been recognized by the National Magazine (ELLIE) Awards and has received grants from the Lower Manhattan Cultural Council as well as National Black Programming Consortium. Madeleine has a degree in Film and Photography from Hampshire College and has an MFA in Film and Media Arts from Temple University. Madeleine is an Assistant Professor of film at CUNY - Queens college in New York. 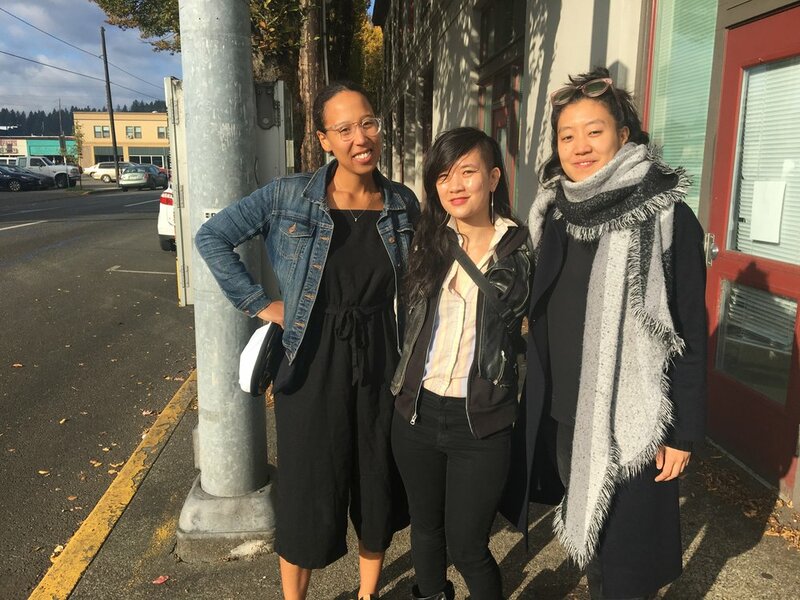 Mimi Thi Nguyen’s famed feminist zine “Evolution of a Race Riot” lives on. “Change something, I double dare ya.” This was the charge Mimi Thi Nguyen posed when she launched the punk rock zine “Evolution of a Race Riot” in 1997. Brave, uncensored and unprecedented-- the compilation featured charged works from punks of color in small towns and far flung cities. It was a landmark work at the unique intersection of punk rock, diy, feminism and identity politics. Against the backdrop of Donald Trump, Brett Kavanaugh and #Metoo feminism, Mimi Thi Nguyen talks about the failures and hope of the last chapter of feminism as she prepares to print the third edition of the zine a decade later. What is your main goal with the film? Punk feminisms and the Riot Grrl movement in the late eighties and nineties is the among latest culture movements to be anthologized, with new documentaries on icon of the movement Kathleen Hanna, recently amassed archives at major institutions across the country. Nguyen’s voice represents a corner of punk and feminism that is often left out of its anthologizing, the voices of poc and queer punks who were contributors to the movement, and importantly, their critiques of these cultural spaces. Today’s political moment calls for a new set of feminist icons and thinkers, and more inclusive histories of women’s resistance and survival. Mimi Thi Nguyen is the voice women need now. How did you find your story and your main character? I read Nguyen’s zine “Evolution of a Race Riot” contemporaneously, and the impetus for the film came from spending time in the DC Public Library’s punk archive and thinking about that particular moment in time and how we will remember it moving forward. Who else is working with you on your team to make this happen? Kristy Choi is an outdoor enthusiast and producer. She works as an associate producer for PBS Newshour and studied Music and Ethnic Studies at Brown University. Is a independent film producer and director, working on productions for the small and big screen. Jon - Sesrie Goff has been a cinematographer and filmmaker for more than a decade working on such films as Evolution of a Criminal and Out in The Night. For his day job he organizes film screenings - formally for the Smithsonian National Museum of African American History and Culture and now as Executive Director of the Flaherty Seminar. Why did you feel like this was a great project to pitch to us at Glassbreaker Films? This is a woman centered film that looks to reimagine recent feminist history with a more inclusive lens. What impact has Glassbreaker Films had on your film and/or on you as a filmmaker? Glassbreaker Films funding has made possible additional filming, and footage and music licensing in order to complete production. What was your reaction when you found our you'd been selected to receive a GBF grant? I appreciated so much the support and confidence Glassbreaker Films has given me, not only because of their support in the project but also their support of my voice as a filmmaker. Any advice to other filmmakers just starting out? Focus on the work. Watch films. It’s about the work. What is your favorite part about being a documentary filmmaker or storyteller? Story - I love constructing story visually and narratively. Filmmaking is like a puzzle of meaning you are making sense of. It constantly keeps you thinking about what needs to be said about being human, what needs to be said about living in relationship to one another. It’s one of the few artistic mediums that is not all about you, but rather, about your subjects and collaborators and what you all want to make. Who's a (woman) filmmaker you admire? And why? Many artists inspire me. Agnes Varda is my she-ro filmmaker, she was so prolific and her films felt so free. She made many different kinds of films, and was never locked in to one genre or style. My artist mentors have not been strictly filmmakers. My artist mothers include mixed media artist and sculptor Simone Leigh and Photographer Jeanne Moutousammy Ashe who I have apprenticed for and who taught me how to work. My real life mother Erica Hunt is a poet whose approach to experimentation is how I look at pretty much everything. Why is representation in storytellers and stories told so important, especially right now? We are trying to learn how to live in a better, less violent, more open society. We have to consider many perspectives to do this. Storytellers are on the frontlines - art is not to be confused with direct action - but story is a part of change making. What's the best documentary film (digital/short/or feature length) that you've seen this year? I loved Hale county This Morning This Evening. Favorite camera to shoot on? I personally love a smaller camera such as the Sony A7S. We have used the Black Magic Ursa Mini and the C100 MkII on this project. Favorite part about the filmmaking process? When you nail a beautiful image or shot - and when you have a breakthrough in the edit. Random fact no one would know about you? I first trained as a still photographer and worked as a photo printer before going to film school. Also I have a dog named Godard for Jean-Luc.